Throughout the country and beyond its borders the Poles celebrate the summer solstice as "Wianki". The spirited celebations embody their Slavic souls and pagan origins. When the sun reaches its highest point and appears to halt in its journey across the sky, the summer solstice - or Midsummer - heralds the onset of summer in the Northern Hemisphere. The astronomical event usually falls on June 21st and festivities organised in and around that day celebrate summer's vital aspect - feritility. Civilisations have celebrated summer solstices since ancient times. The Romans honoured the goddess of fortune, the Druids assembled at Stonehenge, and long before Christianity came to Poland in 966 pagan tribes of the area honoured the sun and the pagan god Kupala - the Slavic goddess of harvest and love. Legend holds that the unique constellation incites people to engage in strange behavior, a belief that inspired Shakespeare in his A Midsummer Night's Dream. The pagan solstice was co-opted by Christianity and rebranded as St. John's Eve. Therefore the celebrations in and around the 21st and 24th of June have many names: Kupala Day, summer solstice, Midsummer, or Wianki. Rituals are magical, linked with symbols of fertility (the maypole, the wreath) and attributed to the elements of water and fire. While in Belarus girls and boys bathe in lakes, and in Sweden they dance around the Maypole, in Poland young maidens dressed in white place flower wreaths with candles - symbols of maidenhood - onto the river. If the wreath gets caught by a man, the girl will get married soon. If it floats, she can hope to get married one day but not in the near future. And if it burns, sinks or gets caught in something, she will become a spinster. As a "test of compatibility and durability", couples leap through the flames of a bonfire while holding hands, and young people go searching for the elusive fern flower to make all their wishes come true. There was only one period in Poland's history (the introduction of martial law in 1981 till 1992) when the celebrations were scrapped. Today they are back on the map, they are known as Wianki and consist of large, open-air festivals with music, dancing and fireworks. The 2013 summer solstice exceptionally coincided with the so-called "Supermoon" - when the moon is at its closest approach to the Earth and makes its biggest and brightest appearance of the year. 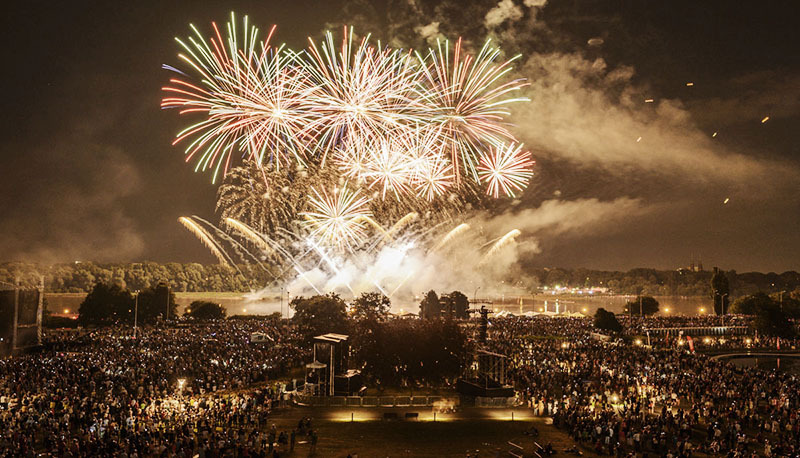 Poland's biggest festivities took place in Warsaw, Kraków and even Rome. 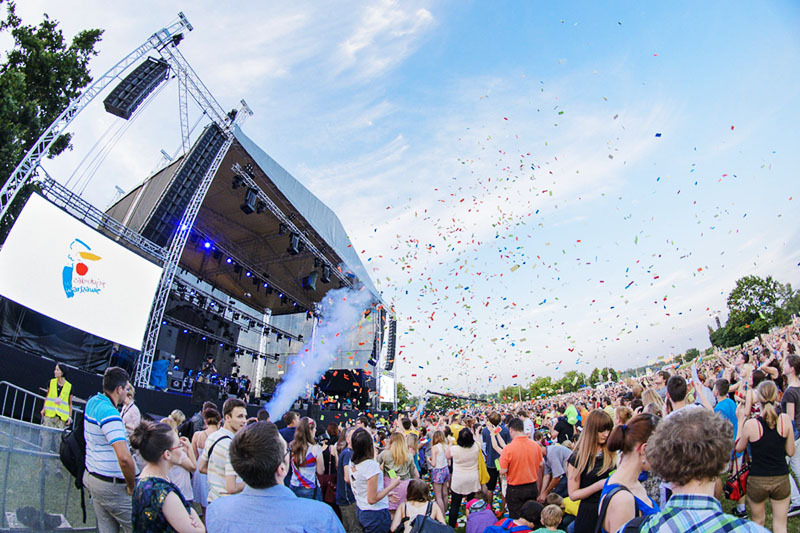 Warsaw listened to the tunes of Mela Koteluk (the 2013 winner of the Fryderyk award for best Debut and Artist of the year [Poland's equivalent of the American Grammy or the British]), the British new wave band New Young Pony Club, the Eurovision 2012 winner Loreen and The Pink Floyd UK. The city's firework show, under the exuberant name Great Gig in the Sky was an explosion of 5 tons of explosives. Making itself a successfully exportable good, Italians and Poles took to the bridges of Rome for the "magica notte di San Giovanni". Dressed in white, adorned with flowers and wreaths, people joined together in rites of good fortune: they made wreaths, watched them glide on the Tiber and listened to the music of Joanna Sowiska & AKT. 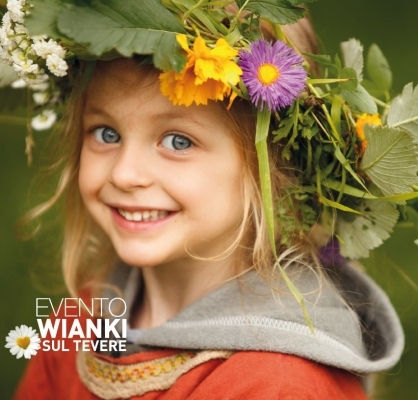 Wianki sul Tevere took place on and around Rome's Cavour bridge on Sunday the 23rd of June. Organised by the Polish Tourist Agency in Rome, the Polish Institute in Rome, Kraków City Hall and the Małopolska Tourist Organisation, the event is considered to be the most lively Polish event organised in Rome to date.